CPU: Dual core Rockchip RK3036 1.2 GHz. Support WPS function, can fast connect with Router and AP compurgation. Online streaming: Youtube, Netflix, Hulu Plus, IDMB, Quickflix, Family On TV etc. Remote controller: Support by Phone/Labtop/Tablet PC. iOS: iOS 9.0 or newer(Devices: For all iPhone model after iPhone4 / all iPad model after iPad 2 / all iPod touch after iPod touch 4th generation. Android: Support Android OS 4.2 with 1GB RAM. 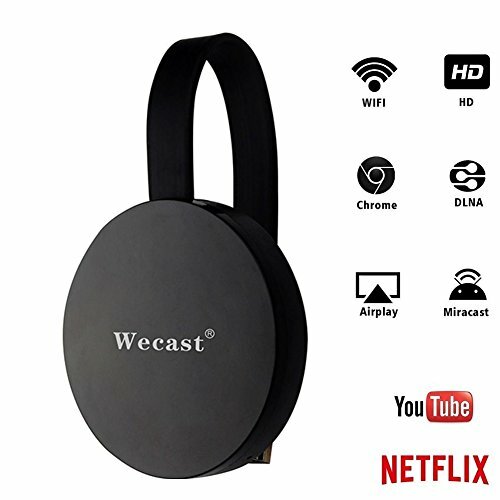 【Upgrade Version】SmartSee Wireless display adapter is an upgraded Wifi display dongle, supports chromecast, YouTube, Netflix, Hulu Plus, IDMB, Quickflix on Android device. Supports Multi Display protocol: Miracast, Airplay, DLNA. Supports Android(4.4+) / iOS(8+) / Windows(Miracast enabled) devices. 【Wireless Display】Absolutely mirror the entire screen of your iOS device or Android device to any HDMI device such as TV, Computer, Monitor or Projector wirelessly. Your iOS/Android device works as a remote control, what users see on the mobile device, they see on the big screen, instantly - no limitations, no restrictions, and no hassle. It can be used for home entertaiment or Business conference or Enducation. Share information effectively. 【Easy Operation】Plug and play, No APP and no need to switch among modes. Only 3 steps to start amazing visual journey, plug-connect-mirroring. Plug it into HDMI jack on TV or monitor, then connect USB to get power, finally sharing by wireless mirroring. 【Appliacation】: This product supports Car HDMI, Like CarPlay. Streaming your phone to your car display easily. Think that, mirror the GPS Navigation from your Phone on your car display for free. It saves money for you. 【SATISFACTION GUARANTEE】All SmartSee products are backed by manufacturer 30-day money back guarantee with a 1-year warranty and our support team will reply within 24 hours for any technical support. If you have any question about this item, please feel free to contact us via amazon. If you have any questions about this product by SmartSee, contact us by completing and submitting the form below. If you are looking for a specif part number, please include it with your message. 2018 YEHUA WiFi Display Dongle HDMI 1080P TV Receiver Adapter Mirroring Screen from Phone to Big Screen Support Miracast Airplay DLNA TV Stick for Android/Mac/ iOS/Windows.